SEAN BROWNING –DRUMS/BACKING VOCAL/BACKING VOCAL/ RAP has cut his teeth playing trumpet in the horn section for a popular Ska band “Rude Shock” in Brisbane in the late 90’s while supporting bands like Mental as Anything and The Porkers, so he likes to dance! Moving on to drums, percussion and vocals, he has played the past 10 years supporting and playing with many of the premium artists in Australia up and down the east coast. He has made albums, gone on tours, won awards, and might bust out a rap just for kicks! The complete professional, he knows the importance of a great show, great bar takings, and working the venue…. Sean is one of the best beat keepers in the country and the engine room of the Crusin the Cosmos experience. Sean plays in 3 Newcastle bands & an African band he is the back bone of Cruisin the Cosmos don’t miss seeing this amazing musician. GRAEME PEREIRA: GUITARS/VOCALS Graeme has been in bands professionally for over 30 years, a passionate lead guitarist, lead/backing vocalist, has been in a variety of covers/originals bands covering many styles from 60’s to top 40 rock/pop. A seasoned performer Graeme has played some great & amazing shows with some of the best in our industry around the traps at pubs/clubs all over NSW. Some of Graeme’s bands include: Hussla, Spider Whyte, Richter Scale, Recovered ,Final Notice, Circus Mule -with highlights including playing at The Imperial Arena at the beginning of the Country Music Festivals 2006/2007, supporting bands such as The Radiators and Dragon. Touring 3 weekends out of 4 all around NSW from Goulburn in the South to Parks in the West all over from Narrabri to Lightning Ridge and Ebor on the Queensland border. Graeme’s influences stem from bands such as Deep Purple, Black Sabbath, Faith No More, Judas Priest all the the way to pop rock such as Beatles, Ice House, Greenday, Offspring and even Pop such as Gwen Stefani Pink etc. Graeme enjoys playing all styles of music whilst working and for fun Graeme enjoys running his Cattle Stud Farm in Strath Cedar NSW and enjoys playing music in his band on the weekends and to enrich more of his future he is studying ‘Psychology’ at Southern Cross University. Graeme looks forward to playing those dynamic riffs in Cruisn the Cosmos at a venue or function near you. DAVE HULME: BASS GUITAR/VOCALS Dave has worked hard for over 30 years in a professional capacity as a musician in the Mid North Coast & North Coast areas. Being both cruisy and talented Dave has worked with in the entertainment industry playing bass player and backing vocalist. Dave has worked with in numerous original outfits and cover bands since moving to the north in the early 70’s. Performance history includes working with well sort after bands such as Nite Shift 1994 – 1998, Flash Ratz 2000 – 2006, TheWilson River Band 2008 – 2010, The Rotors 2010 – 2013, and now Cruisin the Cosmos 2014 till present, Dave loves playing on the coast and has enjoyed working in all areas of the entertainment industry including working as a live performance playing at festivals and events including live performances and corporate affairs. Dave has a vast array of style covering rock, classic rock, pop, blues and top 40 radio hits of today. The CtC Band are loving Daves quirky distinguished style that adds that difference that fans crave for. AL SAUNDERS- LEAD MALE VOCALIST: Al has been singing his whole life, performing professionally for almost 20 years for a great local following up and down the coast from Coffs Harbour to Newcastle in his popular family band. Allan has a voice to be reckoned with and with his warmth from the biggest ballad to the most pumping rock anthems Allan will have you on the dance floor before you know what’s going on. 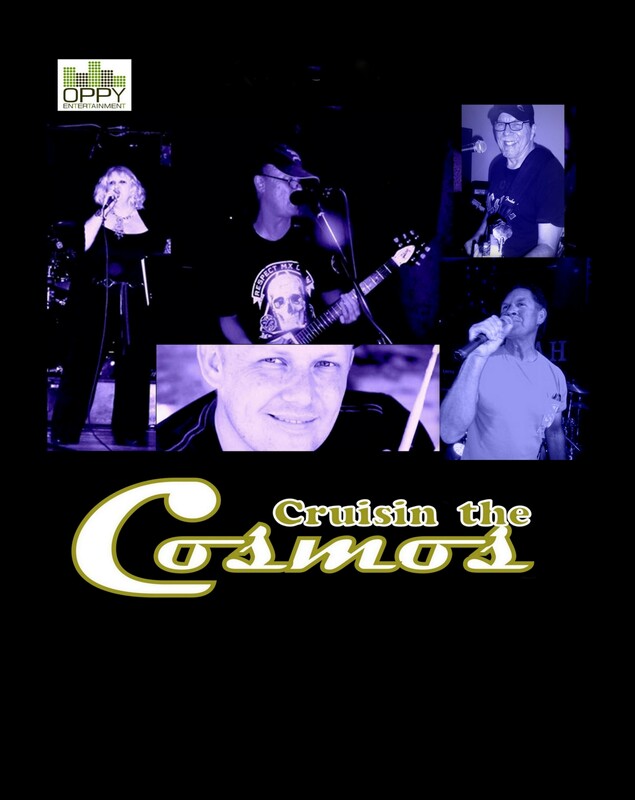 Performed on the same bill as Troy Cassar-Daley, Shakaya, Archie Roach, Ruby Hunter and many more.. Dont miss hearing Allan in Cruisin the Cosmos, his vocals will blow your mind. DEBORAH HARDY – FEMALE VOCALIST Deborah was always artistic from a very young age, winning numerous art shows as a very small child; Deborah was also the lead in most plays throughout her school years. Deborah loves to perform always on stage she was the drummer for a local and for 10 years, is the manager for a very successful family band for around 20 years that is still going strong. Deborah was discovered to have amazing quality vocals by accident and has been performing and has hundreds of fans from Coffs Harbour to Newcastle in the south since. Deborah has a dip in fine arts and graphic design, is very well known as a vocalist around the traps. Deborah will be singing songs that will grab you from the depths of your soul, those songs that rock the pit of your soul with a taste of bluesy grunge.